I think Katie Ashley did a fabulous job with this book. 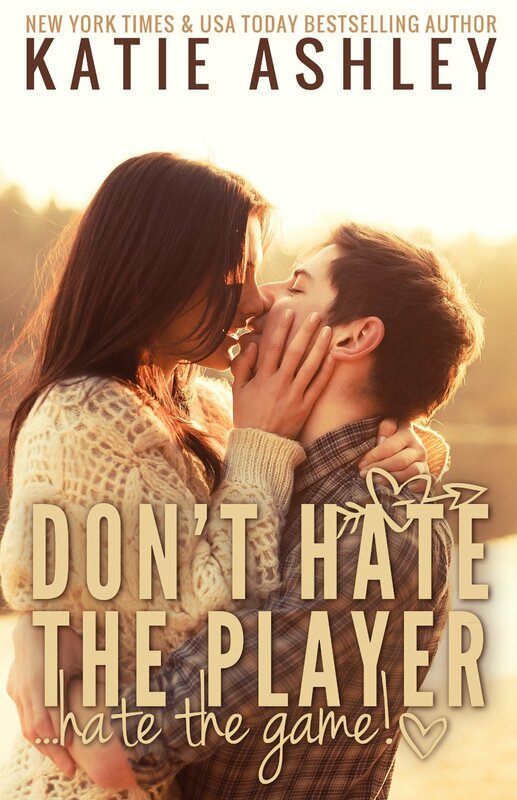 Don’t Hate the Player…Hate the Game is told in a POV, of a 17 year old male. I think Katie did a marvelous job in doing it. I could actually feel the emotions that Noah was feeling while I was reading the book. This is such a great book about young love. Noah Sullivan loses his best friend Jake Nelson, when he is killed in a tragic accident a few weeks before they graduate from high school. While helping Jake’s father gather some of Jake’s belongings from his room for the funeral service, they discover an engagement ring and lyrics from a song. Noah is completely shocked by these findings, as Jake was a confirmed player and never settled for just one girl. Noah learns that he didn’t really know everything about his best friend. There was another side of Jake that no one knew… accept for one girl. A girl that captured Jake’s heart. A girl that Noah had to find. Jake’s mother makes Noah promise to find the special girl who the ring belonged to. There was a girl out there that Jake truly loved enough to want to marry. Jake didn't get the chance to give it to her, however Mrs. Nelson wanted her to have it. While Noah is trying to figure out who this mystery girl is, he is dealing with the memories of his best friend and his grandfather, who had passed a few years back. Noah never really grieved for Jake because in his head he thinks he needs to be strong, that if he shows any emotions, he wouldn’t be a man… My heart broke for Noah. Noah pushes his grief aside to try and find out what girl Jake had intention of proposing to. After narrowing the search down, everything seems to be pointing to a girl named, Maddie. Maddie is the preacher’s daughter, who was tutoring Jake. Maddie is such a sweet girl. Her heart is broken by the death of Jake. Maddie is struggling with her own emotions. Maddie and Noah begin to comfort each other over their loss of Jake. A friendship develops between the two, but Noah is drawn to Maddie like a moth to a flame. Noah begins to develop feelings for Maddie. Once Noah knows that it was Maddie that Jake loved, should he have told Maddie about the engagement ring? Is Noah being selfish for not wanting to tell Maddie about the ring? Does Maddie have the same feelings for Noah? You can see Noah struggling with his feelings for Maddie. Is it wrong that he was falling in love with his best friends girl, even if his best friend was dead? This quote sums up the book in two sentences…. Jake kept his feelings for Maddie a secret because he felt as though he needed to keep up his image… Was that fair to Maddie? The life of one we love is never lost. Its influence goes on through every life it ever touched. After reading this book, I felt as though Jake brought Noah and Maddie together for a reason. Maddie saved Noah from the epic storm of grief. Noah wasn't drowning anymore. Noah and Maddie comforted each other in their time of need and it was heart warming to see their love blossom from such a tragedy. If it weren't for Jake's death, Maddie and Noah wouldn't have found love... Does everything happen for a reason?